Rabbit Stew: Hunter/Blogger: Buy British! Buy BSA! 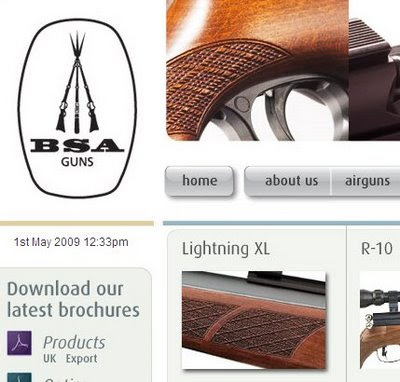 Now [I wrote in an email to BSA about a months ago], given the current recession, it's plainly daft of me to be constantly advertising German guns when UK manufacturing needs all the boost it can get. BSA is a shining star among UK industries and a byword for engineering excellence worldwide; it's shameful and ridiculous that I'm not using one! I know this is cheeky, forgive me, but I thought I'd at least write with a small proposition: If you have, somewhere on a testing bench in your factory, a thoroughly used, scratched up, unsellable pre-charged pneumatic rifle, that was just getting in the way, then - if you were so hugely generous as to throw it my way - then I'd stick a dirty great banner ad at the top of my blog saying BUY BSA! and I'd write about the (undoubted) marvels of the gun to the exclusion of all others for ever more. What do you think? As soon as I hit 'send' I thought, 'Oh God, what a fool I am! Is there any end to my stupidity? What in god's name makes me think that BSA will throw several hundred quids worth of rifle at me in return for a banner on a blog which gets forty visits a day? I am profoundly grateful for the fact that whoever received this at BSA had the outstanding good sense to delete it at once and not bother to reply. That must make you the UK's leading airgun blogger! But how I yearn for the giddy heights of your own 90 visits a day!! You never know- the worse they could do is say no. Now you need to ask again! 90 are on their way, you already do all the things that made my numbers go up, and you write better.